Olaudah Equiano or Gustavus Vassa was living in what is now Nigeria when he was captured from his village at the age of 11 and sold into slavery. He wastaken to Virginia as a slave. He was eventually sold to a ship’s captain and travelled widely. After 16 years as a slave he managed to save enough money to buy his freedom. 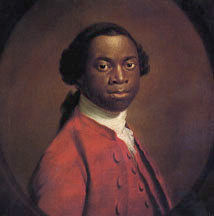 He came to England and wrote a book about his experiences, called The Interesting Narrative of the Life of Olaudah Equiano or Gustavus Vassa the African, written by himself. It was published in 1789, became a best-seller which turned many people against slavery. A child of colour haply not thine own. And follow’d Christ; their hope two infants dear. 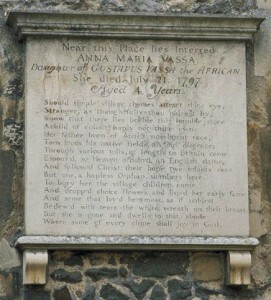 But one, a hapless orphan, slumbers here. To bury her the village children came. Where some of every clime shall joy in God.